The inaugural book will be Alan Brown's I See A Shadow Coming based on the stories of M.R. James. I should actually say all the stories of M.R. James. Alan did over 30 gorgeous pieces covering every single one of James' published works. His paintings are eerie and unsettling, reminding one of Stephen Gammell, Virgil Finlay or "Ghastly" Graham Ingels! Since James is known for his Christmas ghost stories, it's only fitting that I See A Shadow Coming will be available just in time for the holidays. It will also be full of bonus materials. The package will not only include Alan's 8.5"x 5.5." 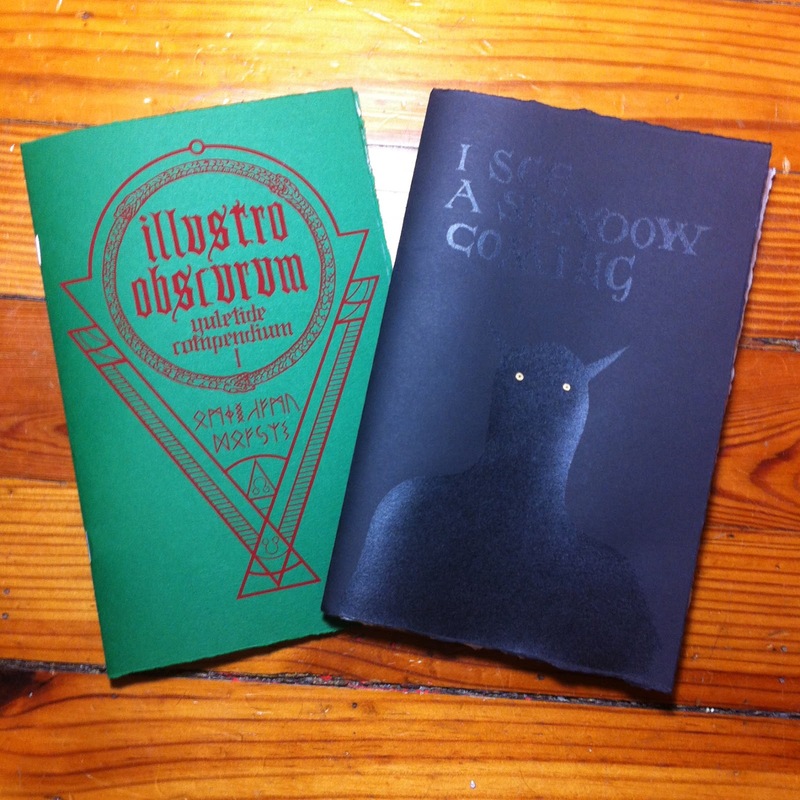 zine, but a mini edition of Illustro Obscurum with my versions of 10 M.R. James monsters and a stunning full color print by Jeanne D'Angelo depicting the creature from James' chilling story The Treasure Of Abbot Thomas! There will also be a few handmade "artifacts" and three additional posters by Alan Brown. I really can't wait for this. Stay tuned for more info next week! Another bit of news today. 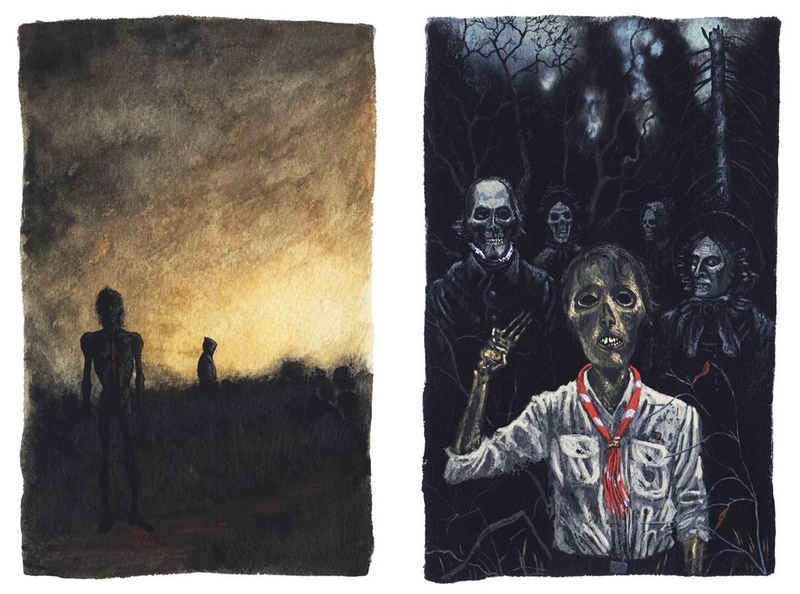 My friend Trevor Henderson is putting a haunted house zine together where a different artist is illustrating each room. Artists include Trevor himself, Jenn Woodall, Alan Brown, Sam Heimer, Kat Verhoeven, Jeanne D'Angelo, Zé Burnay, Andrea Kalfas, Patrick Sparrow, and about 20 other artists. I can't wait for this zine! 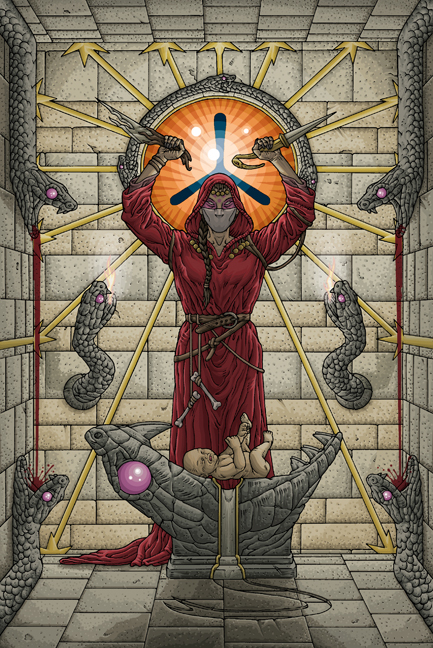 I chose the "sacrificial chamber" and decided to weave my mythology into the piece. You can see a secret ritual performed by the Order Of the Eternal Serpents. 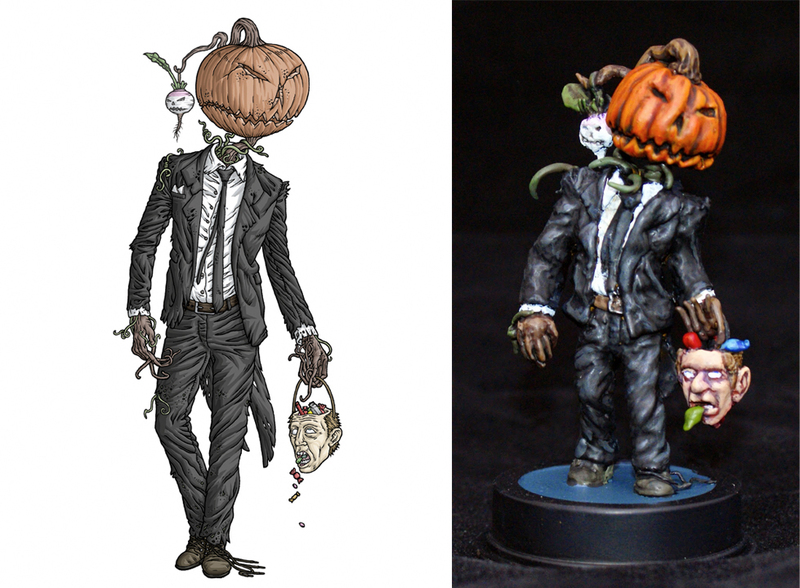 About a month ago, I was contacted by Dave Kirkby asking if it was ok for him to sculpt a miniature of my drawing of Nyarlathotep as Jack O' Lantern (based on Scott David Aniolowski's description). It's part of a Halloween custom he and his daughter partake in every year where they each make creepy sculpts for the holiday. Of course I said yes. I appreciated that he contacted me ahead of time and specified it would be one sculpt and one time. Especially with the problems I've had in the past, it's nice to see someone who's respectful and courteous. So, You can see his progression photos over on his blog, including more detailed versions of the finished piece. Thanks so much Dave for including this in your Halloween tradition! 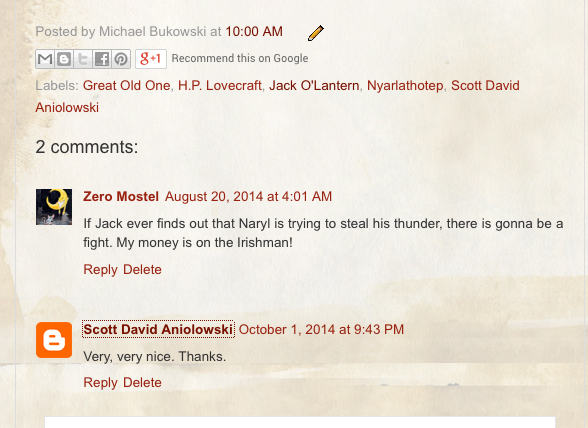 I also JUST realized that Scott David Aniolowski himself made and encouraging comment on the Jack O' Lantern piece on this blog! Be sure to check out his blog, Whispers From the House Of Secrets! That's all for today but later in the week there will be BIG news for Christmas and Yog-Blogsoth/Illustro Obscurum fans! Hey folks! There won't be any new monsters this month, but December will be full of them! This week, I'll be making a few Yog-blogsoth related news posts. This first one is a big thank you to Sam over at the William Hope Hodgson Blog. He featured my WHH birthday monster tribute the first day they were posting. 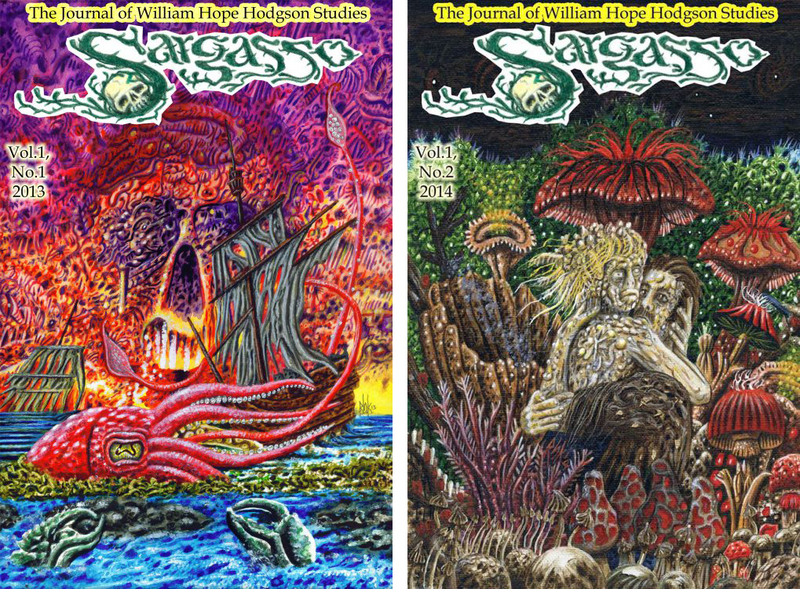 That blog, and the Sargasso zine he edits, are the absolute best source for all things past, present and future concerning Mr. Hodgson. The zines go fast so head over and grab one! Hopefully with all the noise being made, the WHH revival will keep goin on the upswing! 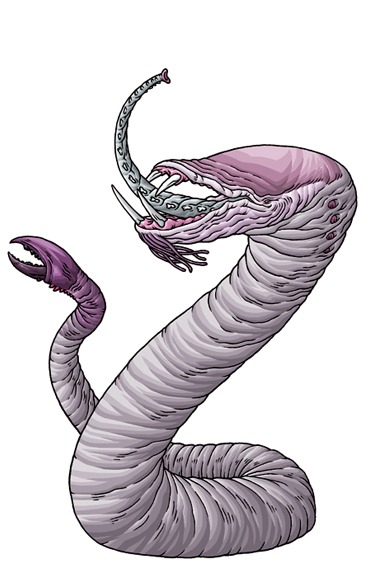 "For a few seconds the hideous creature lies heaped in writhing, slimy coils. Then, with quick, darting movements, the monstrous head travels along the deck. Close by the mainmast stand the harness casks, and alongside of these a freshly opened cask of salt beef with the top loosely replaced. Then those lips open, displaying four huge fangs;"
"There, right about the mouth, is a pair of little pig-eyes, that seem to twinkle with a diabolical intelligence." "It is curling and twisting here and there. It is as thick as a tree, and covered with a smooth slimy skin. At the end is a great claw, like a lobster's, only a thousand times larger." "And well they might show signs of fear, for crawling about the bark's deck were the most horrible creatures I had ever seen. In spite of their unearthly strangeness there was something vaguely familiar about them. Then it came to me that the face that Stevenson and I had seen during he night belonged to one of them. Their bodies had something of the shape of a seal's, but of a dead, unhealthy white. The lower part of the body ended in a sort of double-curved tail on which they appeared to be able to shuffle about. 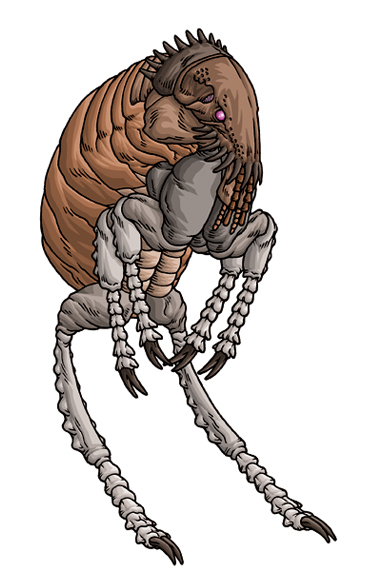 In place of arms, they had two long, snaky feelers, at the ends of which were two very humanlike hands, which were equipped with talons instead of nails. Fearsome indeed were these parodies of human beings!" "Their faces, which, like their tentacles, were black, were the most grotesquely human things about them, and the upper jaw closed into the lower, after the manner of the jaws of an octopus." '"What devilish beasts!' burst out the captain in disgust." "I uttered a great cry; for there, lying upon the deck, on its back, was a gigantic crab, so vast in size that I had not conceived so huge a monster existed." 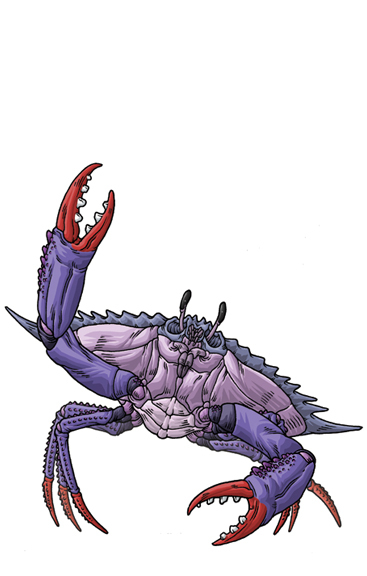 "We had been attacked by a wandering shoal of giant crabs, which, it is quite possible, roam across the weed from place to place, devouring aught that comes in their path." "Then the bo'sun sung out to us to haul the crab aboard, that we had it most securely' yet on the instant we had reason to wish that we had been less successful; for the creature feeling the tug of our pull up on it, tossed the weed in all directions, and thus we had full sight of it, and discovered it to be so great a crab as is scarce conceivable--a very monster." "From the weed itself numberless insects of a peculiar kind jumped like a flea, only that they were a hundred times greater." "It was quite unclothed, and had a remarkable luminous appearance. Yet it was the face that attracted and frightened me the most. It was the face of a swine." "'A pig, by Jove!' I said, and rose to my feet. 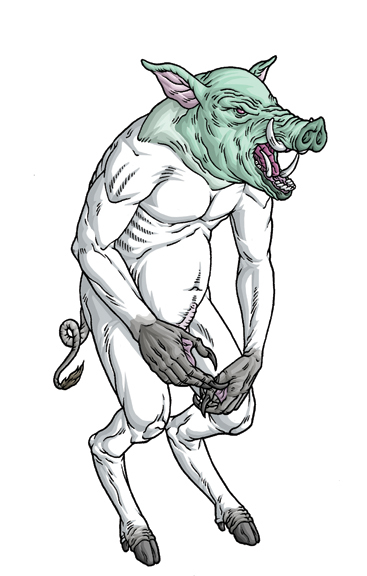 Thus, I saw the thing more completely; but it was no pig—God alone knows what it was. It reminded me, vaguely, of the hideous Thing that had haunted the great arena. It had a grotesquely human mouth and jaw; but with no chin of which to speak. The nose was prolonged into a snout; thus it was that with the little eyes and queer ears, gave it such an extraordinarily swinelike appearance. Of forehead there was little, and the whole face was of an unwholesome white color." "For perhaps a minute, I stood looking at the thing with an ever growing feeling of disgust, and some fear. The mouth kept jabbering, inanely, and once emitted a half-swinish grunt. I think it was the eyes that attracted me the most; they seemed to glow, at times, with a horribly human intelligence, and kept flickering away from my face, over the details of the room, as though my stare disturbed it." It appeared to be supporting itself by two clawlike hands upon the windowsill. These claws, unlike the face, were of a clayey brown hue, and bore an indistinct resemblance to human hands, in that they had four fingers and a thumb; though these were webbed up to the first joint, much as are a duck's. Nails it had also, but so long and powerful that they were more like the talons of an eagle than aught else." 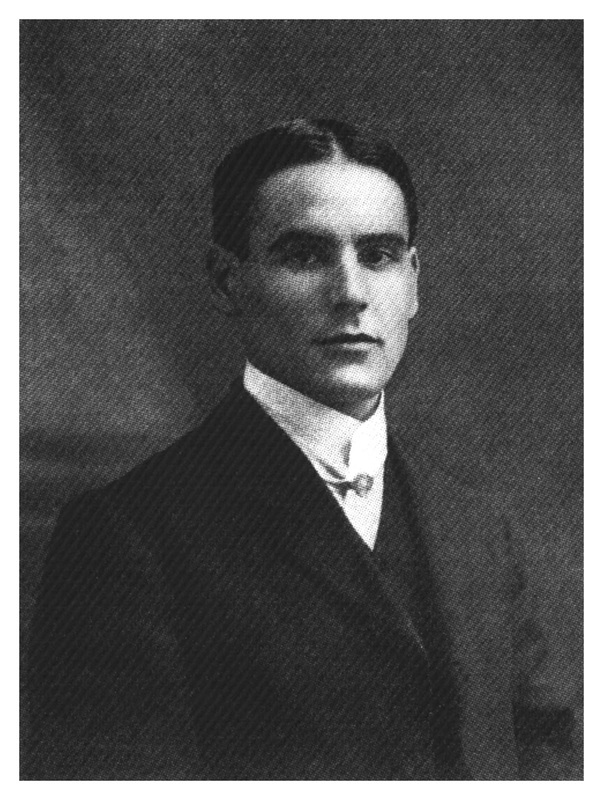 Sunday November 15th is William Hope Hodgson's birthday. 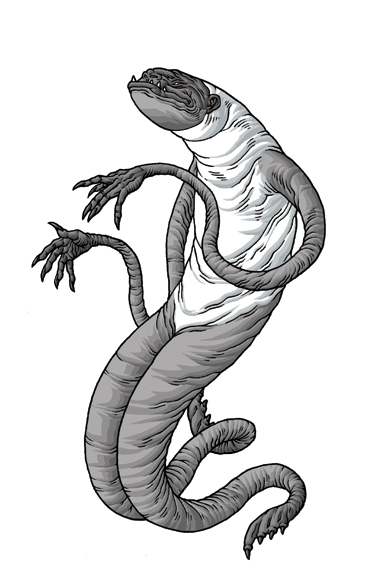 To celebrate, everyday next week I'll be posting a new monster from a Hodgson story. Not only did Hodgson write one of my favorite weird fiction short stories (A Voice In the Night) but he lived an extraordinary life. Born the son of an Anglican priest, he ran away from home to become a sailor at age 13. Though he got caught, he eventually received permission to become an apprentice on a ship. He found himself frequently bullied by other sailors because of his good looks and short stature, so he learned how to fight and soon the bullying stopped. That's pretty exciting right? Well he also won an award from the Royal Humane Society for rescuing a fellow sailor from shark infested waters, was a notable photographer, opened his own "gym" (W. H. Hodgson's School of Physical Culture) and "pranked" Harry Houdini! He served in WWI as a Lieutenant in the Royal Artillery where he was thrown from his horse and broke his jaw. However, he reenlisted and was sadly killed by an artillery shell in Ypres in 1918. I love Hodgson's work even though it can be a bit repetitive (recycled plot elements appear often) and I'm fascinated by his life. Here's to hoping his work has the same renaissance that HPL and M.R. James have experienced. PS-A Voice In the Night was the inspiration for the Toho psychedelic romp Matango. I highly recommend it! "Mr. Hodgson is perhaps second only to Algernon Blackwood in his serious treatment of unreality. Few can equal him in adumbrating the nearness of nameless forces and monstrous besieging entities through casual hints and insignificant details, or in conveying feelings of the spectral and the abnormal in connexion with regions or buildings." Hey everybody! Next week will be a full week's worth of special monsters, but until then enjoy this morsel. Lucas Korte over at Shoggoth Kinetics did an interview with me about the history, categorization and inspiration behind Yog-Blogsoth. Check it out HERE.